The question of what's next for the sixteenth-floor space formerly home to Sixteen at Trump International Hotel & Tower Chicago now has an answer. Executive chef Nick Dostal has reconcepted it into Terrace 16, a restaurant celebrating the flavors of land at the height of harvest year-round. Look for New American dishes such as Ora king salmon, garden toast, black cod and crispy chicken accentuated by some of the vegetables and herbs grown on the terrace garden. 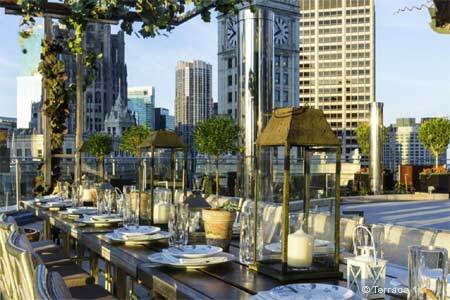 Terrace 16, Trump International Hotel & Tower Chicago, 401 N. Wabash Ave., Chicago, IL 60611, 312-588-8030. It's a rosé-on-the-river summer at River Roast. For $35, diners can enjoy oysters plus rosé on the expansive patio from 3 p.m. to 5 p.m. River Roast, 315 N. LaSalle St., Chicago, IL 60654, 312-822-0100.